The FBI is conducting court authorized activity in connection with an ongoing investigation in Norwood, Massachusetts. After five hours of investigating inside and around the outside of 109 Washington St., in Norwood, Massachusetts, the FBI and Norwood Police left with a large black case, a garbage bag full of something and other items from the house. Michael Desantis has lived across the street from the address his entire life. He said he knows the family who lives there well. "We say hi, she taught me how to get hummingbirds into my yard," he said. "I know he rebuilds guitars and build his own." In fact other neighbors necn spoke with who did not want to go on camera all spoke kind words of the family who lives at at the address. 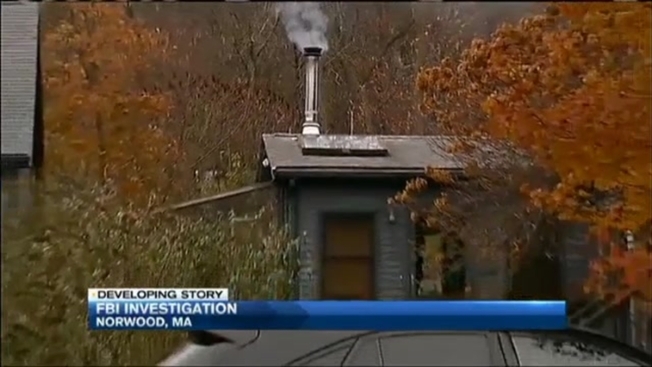 In the last few weeks,they were 2 other FBI investigations in Norwood Massachusetts… I asked the FBI about that and if there was any connection to this investigation, but they couldn't comment.